Preheat oven to 425F. In a large bowl, toss broccoli florets with 2 tbsp. oil, coriander, cumin, 1/4 tsp. salt, 1/2 tsp. black pepper and chile powder. In a separate bowl, combine shrimp (thawed and drained, if using frozen), remaining 2 tbsp. avocado oil, lemon zest, remaining 1/4 tsp. salt and remaining 1/2 tsp. black pepper. Spread broccoli in a single layer on a baking sheet (or I used a large cast iron frying pan) and roast for 10 minutes. Add shrimp to baking sheet and toss with broccoli. Roast, tossing once after 10 minutes. 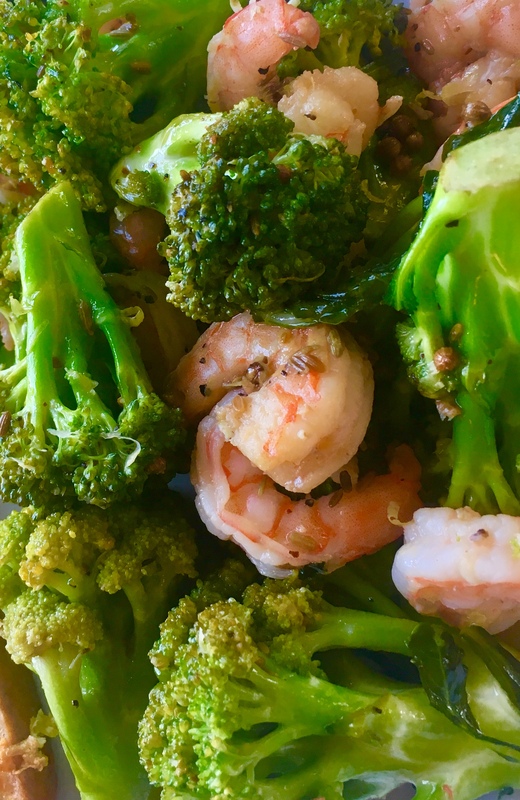 Cook until shrimp are pink (and curled) and broccoli is tender and golden around the edges, about 5 to 10 minutes more. Serve with lemon wedges, or squeeze lemon juice all over shrimp and broccoli just before serving. Tagged black pepper, broccoli, cayenne, chile, coriander, cumin, florets, lemon, salt, shrimp, zest. We cooked our first turkey in Cabo on Christmas Day. I should have used the wood-fired oven, but I’m still learning how to use it properly and didn’t want to risk ruining our precious bird. We shared a lovely meal with Ron’s brother, David, and good friends, Andrea, Pablo, their four month-old baby Tobias, her friend, Giovanna, and our long-time friend, Scott Parsons. 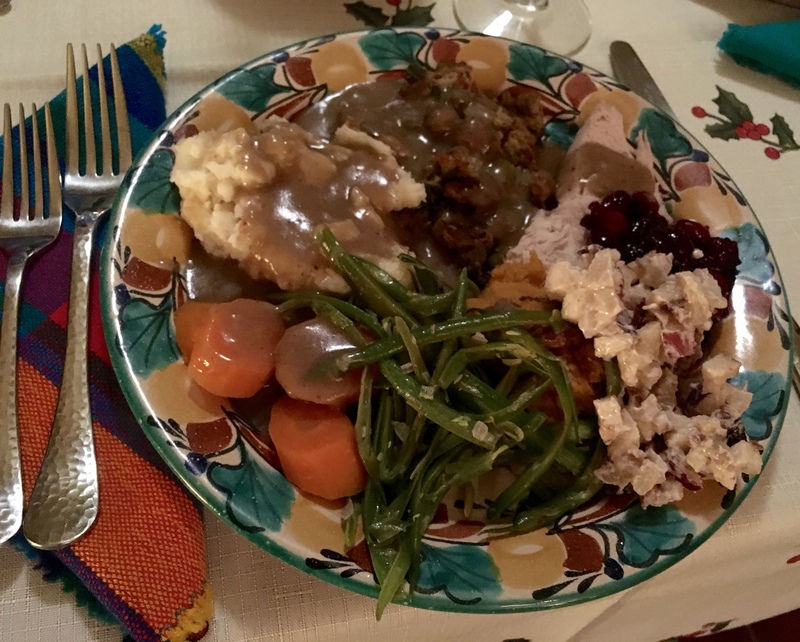 It was a VERY traditional dinner: turkey with bread stuffing, mashed potatoes, sweet potato casserole, carrots, green beans, cranberry sauce (with Serrano chile, of course! ), a Mexican variation on Waldorf Salad (thanks to Andrea – it was delicious!) and Tres Leches Cake for dessert. Meanwhile, a few thousand miles away in Canada, my precious Mom came out of holiday dinner retirement and was preparing a very similar meal for my family. It’s been years since she (or I, for that matter) has prepared a turkey dinner – a meal that she has always enjoyed making. In order to make the undertaking manageable, she prepared everything she possibly could well in advance of Christmas Day so that she could enjoy herself and not feel overwhelmed. The dinner was a GREAT success and I’m so proud of her. At 87 she’s not afraid to take on new challenges and push herself to do more. We sent lots of leftovers home with our guests and still had plenty left for several meals in our home. On Christmas night, I stripped off all of the meat from the turkey carcass and made a huge pot of soup broth. 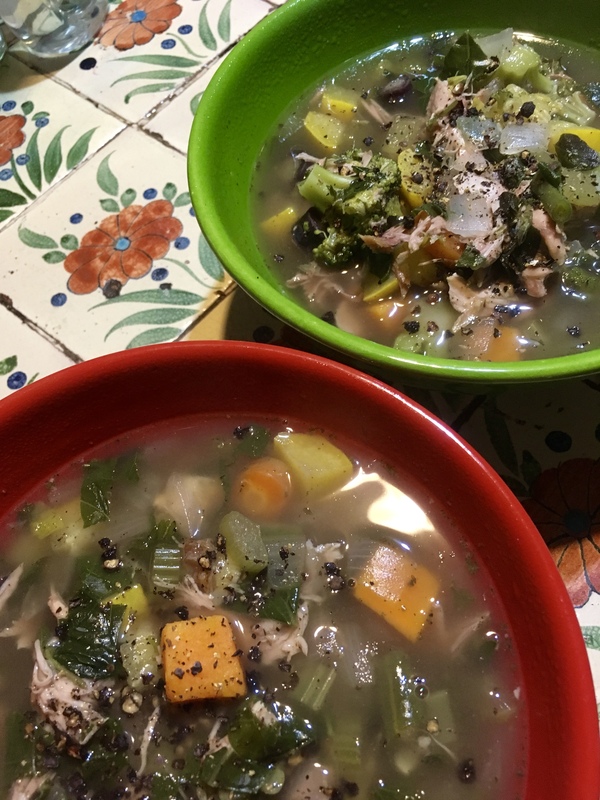 Two days later, I made turkey vegetable soup and used an amazing array of organic vegetables and herbs from our local market: onions, celery, carrots, sweet potato, yellow squash, green beans, broccoli, kale, parsley, thyme, sage, and oregano. I made a BIG pot of soup and we will be enjoying it for a few more days. Almost as good as the original turkey dinner, it’s a tradition that makes the holidays complete. Tagged bread stuffing, broccoli, broth, Cabo, Canada, carcass, carrots, celery, challenge, Christmas, cranberry sauce, dessert, dinner, family, friends, green beans, herbs, holidays, kale, leftovers, mashed potatoes, meal, Mexican, onions, oregano, organic vegetables, parsley, sage, soup, sweet potato, thyme, Tres Leches Cake, turkey, Waldorf Salad, yellow squash.